Might the ultimate comfort food come from a box? If so, can we parents at least make it organic? Kids answer: No. Don’t even try to touch my Kraft cheesy powdered mac-n-cheese with anything whole wheat, organic or homemade. 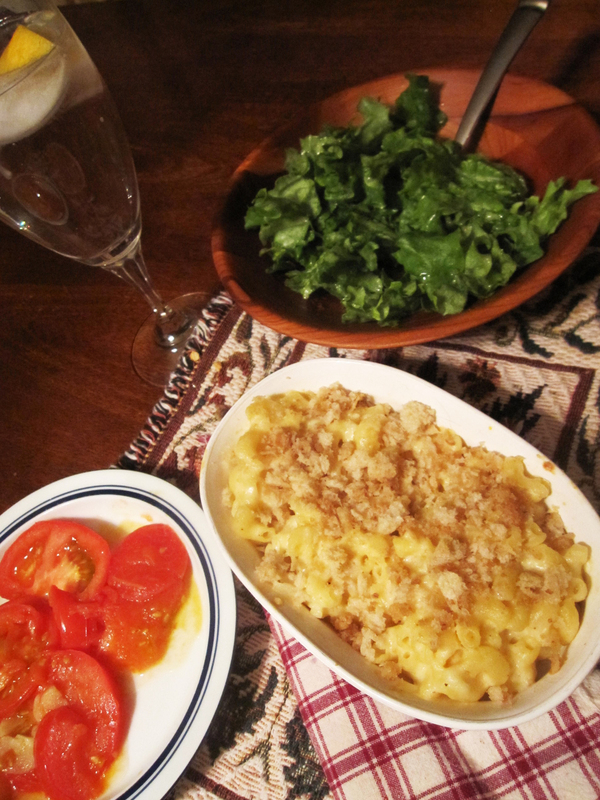 In search of the ultimate winter comfort-food for adults and kids alike that is super flexible, I recently landed on a recipe for Mac-n-Cheese that includes multiple cheese variations, breadcrumbs and roasted tomatoes from Martha. In previous attempts, I’ve added mixed veggies, ham and bacon to the dish. 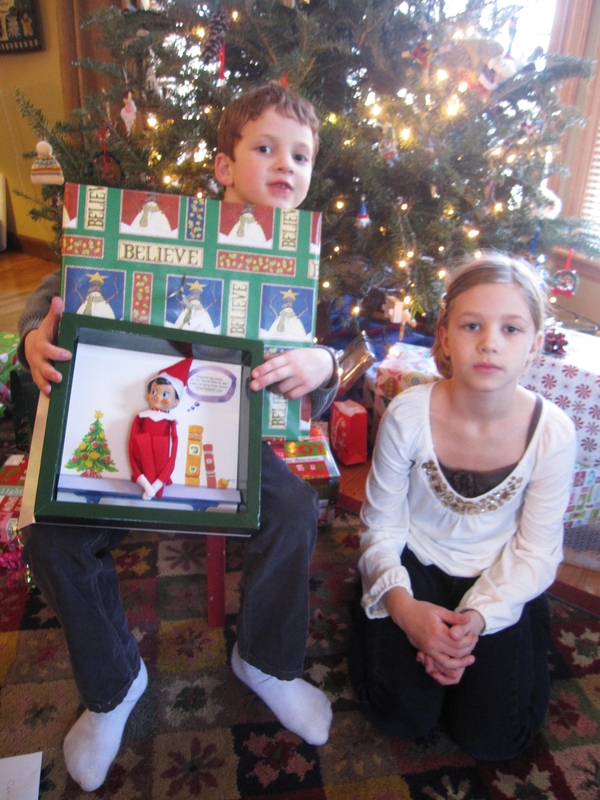 As far as the kids are concerned, it wasn’t quite Kraft. I needed to try again. It really frustrates me that they prefer Kraft to mine, which included way too much yellow onion in their opinion. They gave it a thumbs down. I tell them the difference in ingredients. 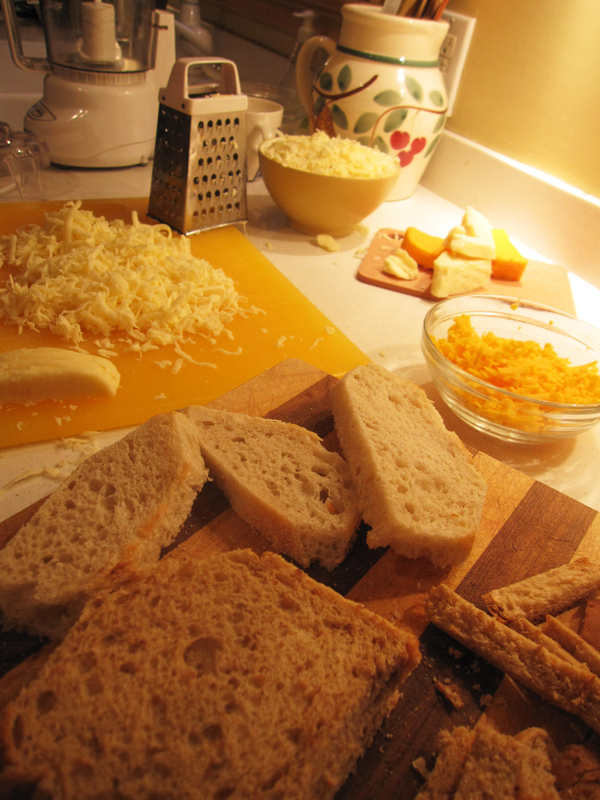 I have my 8-yr-old son, Calvin, heavily involved in the shredding of the four cheeses, tearing and processoring of the bread into breadcrumbs and vigilantly monitoring the whole mix flour mix so that it doesn’t burn and reaches the perfect consistency. Processing of Breadcrumbs: Worth It! Maybe had they not had the Kraft version ever, I’d be able to sway them (they’ve been around for 75 years; see their Facebook page) My kids – Calvin and 8-yr-old Ava – have quite a palette for cheese. I thought they would, or rather should, be open to Guyere, Pecorina and sharp cheddar. Some of their reaction could have been due to last minute missed steps and presentation. We made the dish on a Sunday with the idea of popping it in the oven on Monday night for dinner after the workday. Something was lost in translation. Despite a handwritten note to my husband and an email with the link to the recipe, the dish did not get the breadcrumbs added and did not see the likes of the oven. Rather, it went straight from fridge to microwave, losing much of its appeal. I arrived home later than their dinner time and realized the mac malfunction. I made it right for my version in a 350 oven. I thought it worth it with the surprise element: breadcrumbs. I have never been a crouton fan (my Dad did not claim to recognize them on a salad we served him years ago), nor into breadcrumbs. They made the dish. I discovered the importance of multiple textures in a dish years ago, and this was one such example that was more satisfying because of that mix. I would suggest not to skimp on this step if you make a mac dish. I also knew the roasted tomatoes on top would be a tough sell for the kids. I sauteed them on the side and added a green salad to round out the meal. One kid said straight up, “Mom, you’re not gonna wanna hear this, but I actually hate it.” The other couched it more gently. I made that one most vocal kid try my more perfected version. He admitted a step up, but he was not willing to budge overall. 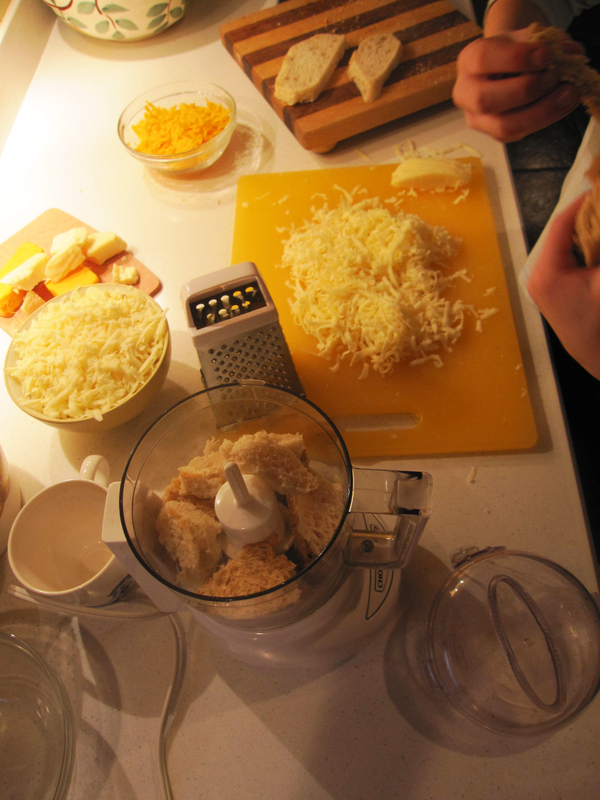 At least we had fun making it – shredding, tearing, processing and thickening. 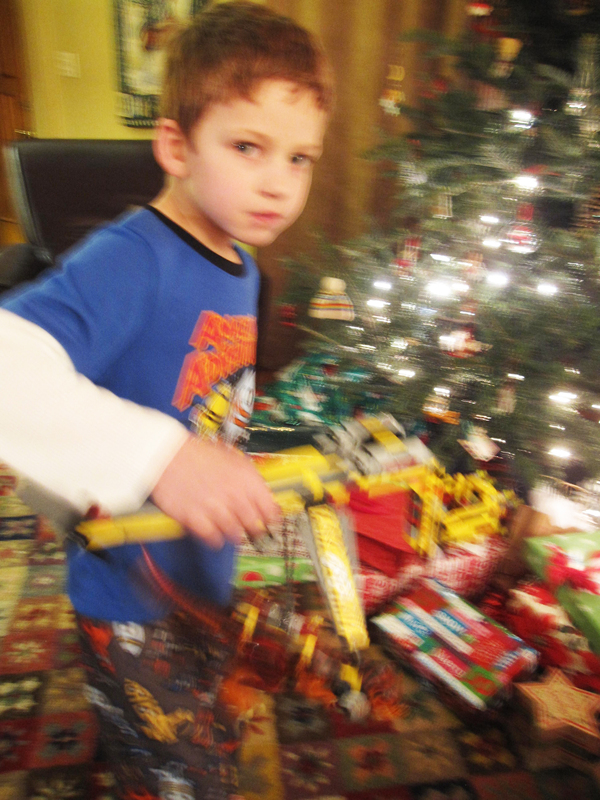 I also polled other mommies who echoed my frustrations – another factor lessening the blow. But Kraft, just so you know, I’m keeping at it, in search of my kids’ ultimate thumbs up on my homemade mac-n-cheese. People’s opinions on owls range from spooky to cute. I might be dating myself if I mention the first owl I ever realized was Woodsy the Owl via a rather large jigsaw puzzle. Since then, owls have appeared in children’s stories from the Berenstain Bears’ Bears in the Night to grown-up pop culture reads like Downtown Owl. I happen to know the Target design team has been obsessing about them too – a good nuetral baby shower theme, no doubt. And then there’s my daughter’s owl robot. In summation, the wide-eyed and fully feathered owl has been on my mind. So much so that when I saw a crafty create-your-own kit at Paper Source, I didn’t buy it. Instead, I bought the paper and mulled over the project and my ambition for a few months. My 8-yr-old daughter, Ava, co-obsessed with me about owls. Finally, on a recent chilly Sunday, we were ready for the owls. We brought out a few items for inspiration including buttons, ribbons and the items from our Target run the day prior including a package of googly-eyes and owl stickers. Our kit of parts included paper, eyes (in four sizes), stickers and scraps from our bin of leftover crafts (felt with backing, misc patterned paper). Scene 1: The owl family waives good bye to the Daddy Owl who went on a trip. We upgraded his luggage for the flight on (F)Owl Air. 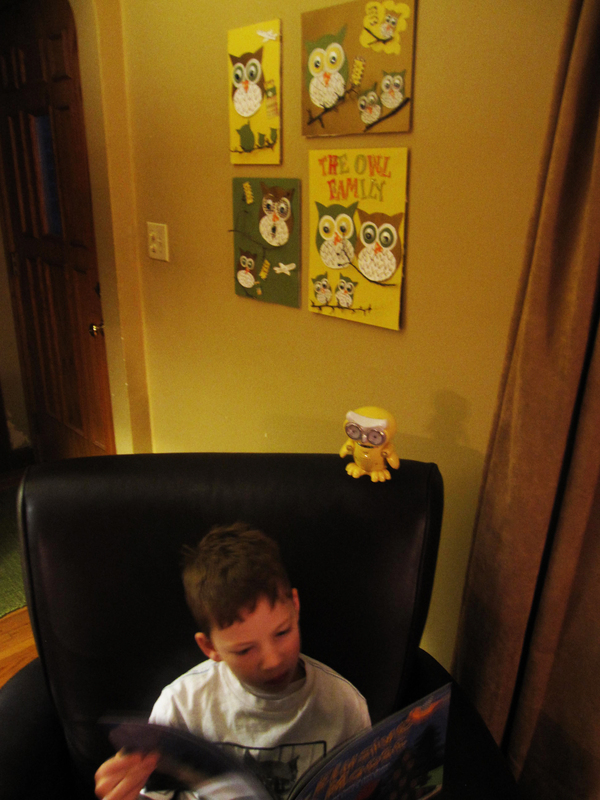 Scene 2: The owl family chats with Daddy while he’s out of town. They are sad. They miss him and want him to come home soon (please bring back our new community iTouch as well). Scene 3: The Daddy Owl takes an early flight back to his home tree, much to his boss’ dismay. Scene 4: He’s reunited with the whole googly family. The End. 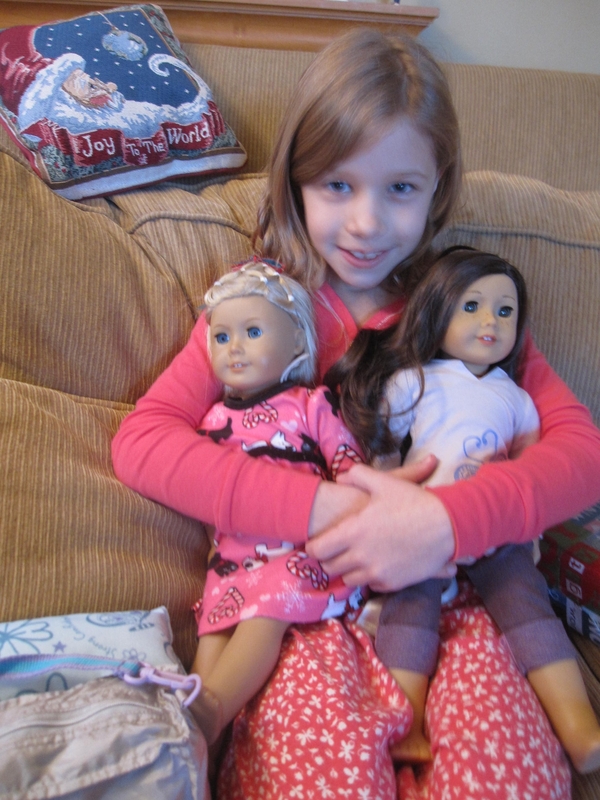 A fairly simple story, but I made Ava describe the important elements of the story to share. She was adamant about its content and length. This expanded what could have been a two-board story to four, thus doubling the hours (there are 11 owls, 2 eyes a piece and 3 felt/paper layers per eye). 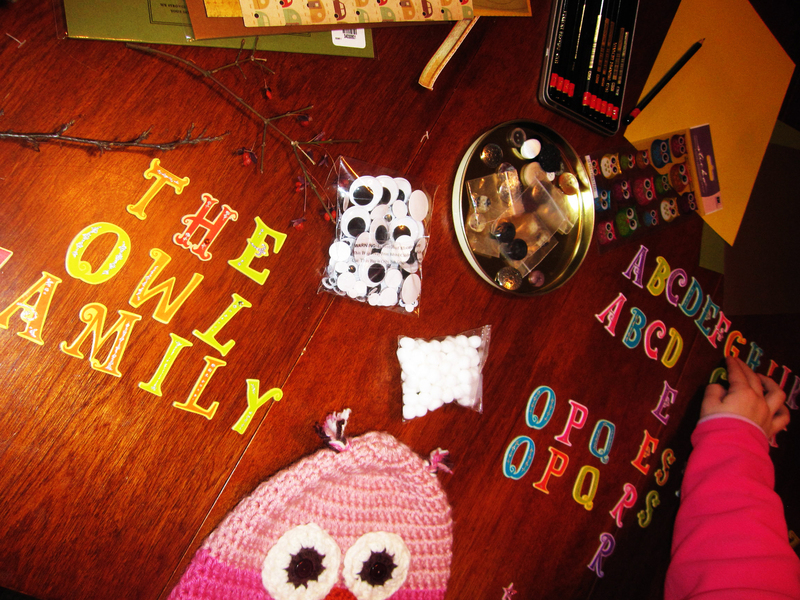 After four hours of patterning (based on stickers and finding right-sized circles to trace), cutting and gluing the owls, the last elements – decidedly organic or found – would be gathered on a walk. We came back with small twigs and branches and I was extremely happy to put the hot glue gun to use for the second time ever. We organized the owls and twigs on our boards and let it be until the next day. We haven’t figured out framing – possibly with ribbon or wood – but for now, the Owl Family is prominently on display in our living room in clashing yellow-gold. You can bet I’ll always be looking over my shoulder while reading in that room, wondering who is watching me. 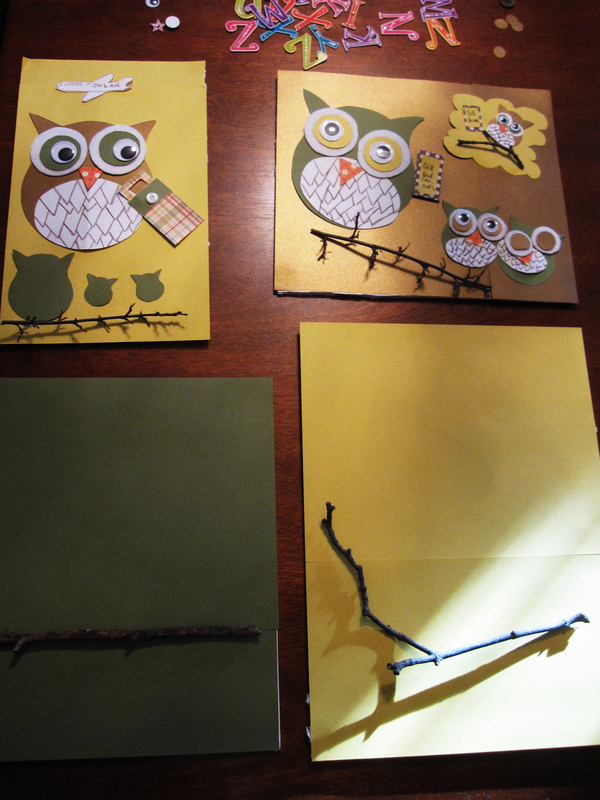 Winter, even if unseasonably warm (January 10th and it’s 50 degrees), is the perfect time to get crafty. The inspiration to create also coincided with the non-frequent occurence of kid-centric programming at The Walker Art Center’s First Saturday and The Minneapolis Institute of Arts Second Sunday on the same weekend. We went for it with visits to both totalling five hours of art and inspiration. I sometimes feel like my 6 and 8 year-olds have evolved beyond the programming both museums offer, but then I’m reminded how much, even as an adult, I enjoy it. I love that we can experience these things – performance and art – together and take away very different interpretations and find meaning for our lives in specific ways. Let’s start with the Walker. Admission is free on the first Saturday of the month (as well as every Thursday night) with content especially for kids. It was 10:30a.m. on Saturday and I’m in the mode to get the kids psyched to venture out. My 8-yr-old daughter, Ava, says she’s on board. My 6 yr-old son, Calvin, hems and haws and doesn’t want to give up his chance to view Star Wars on DVD for the second time in his short life. He is so outraged about having to go, that our Walker appearance looks to be in jeopardy. Then Ava and I start a discussion about what we’ve seen there on our numerous past visits. Calvin begins to come around, citing mostly the fabulous performance art we’ve seen there over the past year or so – the Raven, the acrobats and the beat box/hip hop for starters. He is pumped. We arrive at 10:55 and easily park and slip into the first scheduled 11:00 performance of the day focused on Hmong Tiger Tales. We hear a series of four stories from a creative group from Mu Performing Arts who use four actors in and out of masks. It holds even the little ones attention at 35 minutes and you can meet the actors and try on their masks after. We bypass that even though I am always encouraging. My kids’ ages are starting to equate with such self-conscientious and non-Mom coolness that I have to let it slide. We head to the lab for an activity which involves a wheel of fortune to dictate your art form direction (this is consistent at the Walker and I am thankful for a theme and some sort of direction to focus our efforts). The wheel determines form (cone-shaped, foam, etc) and feeling to evoke with design. Ava got the cone-shape for direction and Calvin the foam. 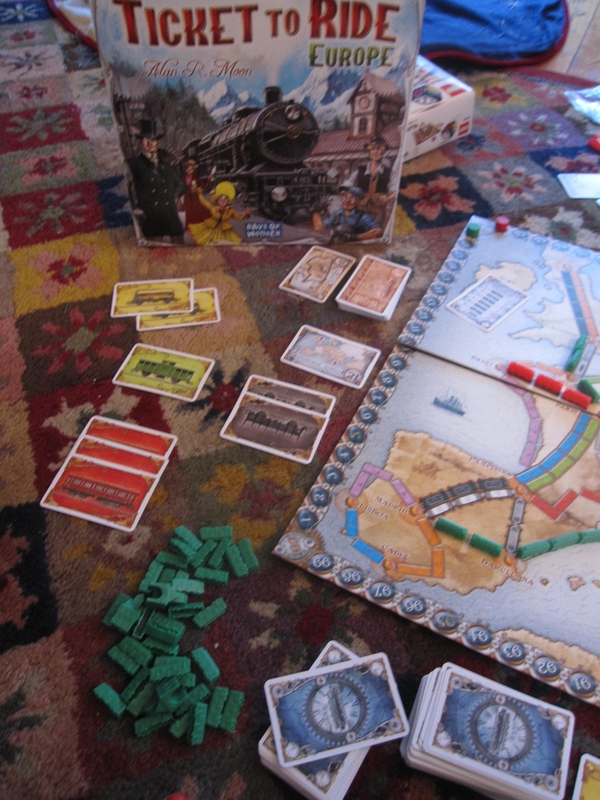 Both ended up with “tiny,” although other more sought-after adjectives were in the mix. 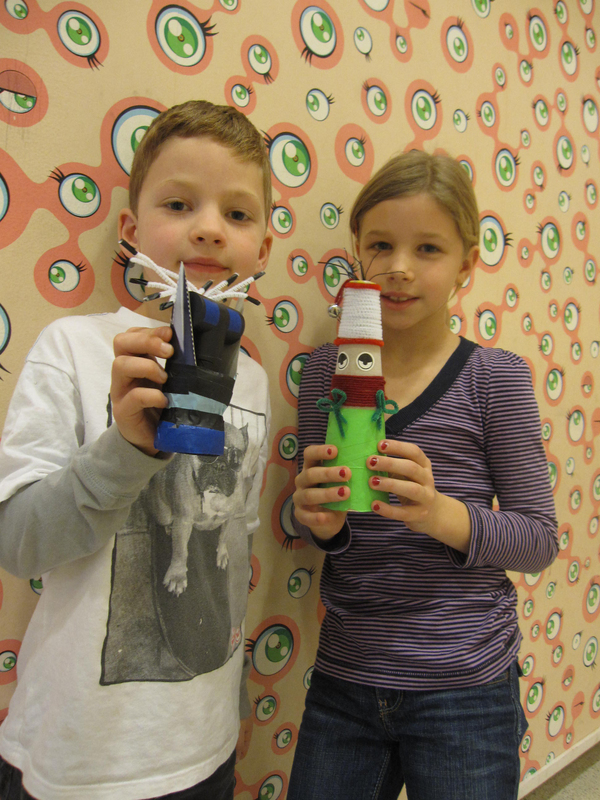 There are a wealth of supplies and a certified hot-glue-gun artist volunteer to aid creativity. I sometimes feel overwhelmed trying to create something out of nothingness, but the kids push on with their vision. It is a better process when everyone contributes – see exhibit A: Ms. Claus and Batman/Artoo-Detoo (note: due to recent StarWars credit viewing of the accurate spelling of this robot’s name, the R2-D2 I envisioned his name to be for a significant portion of my life was challenged). We spent about 1 hour and 45 minutes at Walker. Plenty for the day. Weekend day #2 starts with brunch at the Grand Cafe on 38th and Grand in Minneapolis. 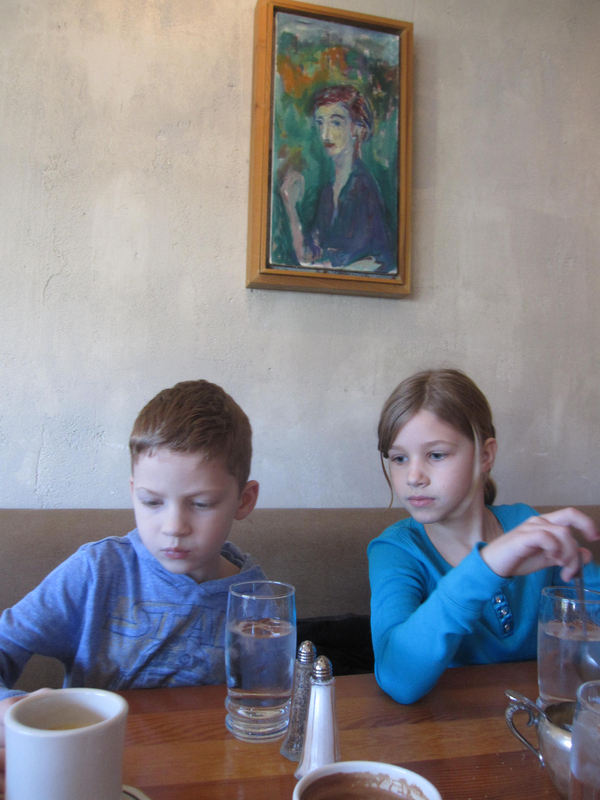 As Van Gogh-like artwork hovers over our table, I’m reminded I have yet to purchase The Van Gogh Cafe book for mommie/daughter book club tonight. First up, a visit to MIA. Just my daughter and I venture out. We arrive at noon with intentions to move through fairly quickly. Impossible given our agenda. I’m seeking to do a refresh of Art Adventure art I’m presenting at my kids’ school January – February and Ava is set on the seek and find related to the day’s theme of Earth, Wind, Water and Fire. We start with a performance in the Pillsbury Theater from dancers that evoke the theme of fire. We then get in on the exhibit: Edo Pop: The Graphic Impact of Japanese Prints. It reminds Ava of Ponyo the movie. She spends some time sketching in the exhibit and we take in the captivating multi-media exhibit of what Ava terms Worms in Japan. Deep. The 4-yr-old next to us keeps repeating, I’m not scared, I’m not scared. After three hours, I’ve located six of my eight pieces of art, Ava has found all of her themed pieces in the Family Gallery Hunt for the day titled Elements Exploration and we even had the opportunity to touch the art via the Art Cart in the Pacific Islands area of the museum. We turn in our completed worksheet and answer questions about our favorites: Deer by Stormy Sea (element: wind) and Cottage on Fire (element: fire). Then due to our schedule we bypass the crafts for the day and head home. We go to our book club despite not having read or found the book via library or to purchase, nevertheless enriched from the weekend’s art experiences. I applaud these museums and the tools they give us busy parents to give us the ease and confidence to help our children explore and define their feelings about art at an early age. With the repetitive museum visits we’ve done over the past three years or so, I am now seeing an emergence (especially from my 8-yr-old) in how she assertively connects with a theme, establishes her own point of view yet maintains an openness about art. Next up, Ava wants her artwork on in the Children’s section of MIA. Look for her work in a gallery near you….